Welcome to the South Woodlawn Neighborhood Association site! We meet at 7:00 p.m. at the Woodlawn Christian Church, 4339 Woodlawn Pike [map to church]. Watch for our neighborhood meeting signs that are put out the weekend before the meeting. SWNA Observes National Night Out Instead of our normal meeting in September, SWNA will participate in National Night Out. Check back soon for information about this family-fun event! 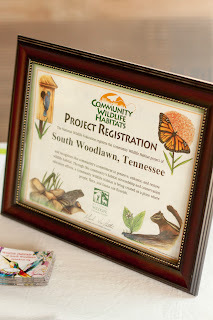 We have reached our goal and have become the 1st Community Wildlife Habitat in the State of Tennessee and 75th in the nation. In recognition of this achievement, we had a party at Stanley's Greenhouse on Saturday April 12, 2014. In order to remain certified, we must continue to earn points each year. We will be posting opportunities to become involved as we identify projects for our 2015 certification. Visit our Wildlife Habitats of South Woodlawn page for more information about this project. [http://www.raidsonline.com/] for a map overlay of reported police incidents. Our community continues to change – we want you to be a constructive part of that change! Dues are paid at the beginning of each year. Membership for those joining at the November meeting will carry through to the following year. If you do not wish to become a member at this time, you are still welcome to attend the general meetings, hear the speakers and give voice to your concerns related to the neighborhood issues. Visit our discussion page to join our email list and keep up to date with happenings in your neighborhood and South Knoxville. You can also reach the association by email: info@swna-knox.org or phone: 865-686-6789.